Bengaluru, India is a part of the Logistics Plus® network. This office provides air and ocean freight forwarding, inland ground and rail, warehousing and distribution, project cargo, import/export, and global trade compliance services. Bengaluru is located in central India and is the capital of the state of Karnataka. 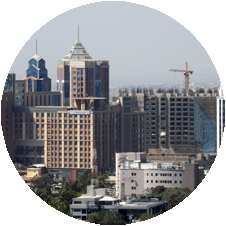 Bengaluru (also called Bangalore) is known as the “Silicon Valley of India” because it is the country’s largest IT exporter. It is also a major economic and cultural center. The city is home to Bengaluru International Airport, which is used by ten cargo carriers. Bengaluru is part of the South West Railway line for Indian Railways, meaning that it is connect to is connected by rail to most cities in Karnataka, as well as New Delhi, Mumbai, Chennai, Coimbatore, Kolkata, Hyderabad, Indore, Belgaum, Hubli, Mysore, Bhagalpur, Tatanagar, Trivandrum, Bhopal, and other major cities in India. Bengaluru is also home to a Logistics Plus office where we proudly serve both small and large businesses throughout the region. If you’re located in Bengaluru, or any other surrounding community, your friends at Logistics Plus are ready to provide you with local, domestic, and global transportation and logistics services. Additionally, we’ll show you how our people in India put the “plus” in Logistics Plus by doing the big things properly, and the countless little things, that together ensure complete customer satisfaction and success!